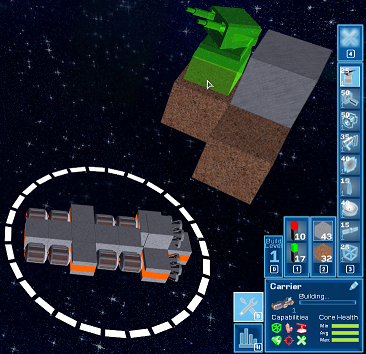 In the first column, you see the loaded buildable items (e.g. antennas or buoys). You can select one of these (by clicking on it or using Hotkey 1) and move the mouse into the sandbox world to build it. A blueprint will appear, indicating wether the item can be placed or not (green, resp. red). Press the R key or middle mouse button to rotate the item before placing it. Finally, right-click to build the item. In the second column, you see the loaded blocks. You can select one of them to build it (by clicking on it or using Hotkey 2). With a right-click, you can attach a block to an existing item, building, or block. If none of these are present, the block will be built on the height-0-grid. With a left-click, you can erase blocks again. In the third column, you see the buildings available at the selected level. A building will always be built out of the block material, which has been selected last. The building icon shows how many blocks are required to create that type of building. 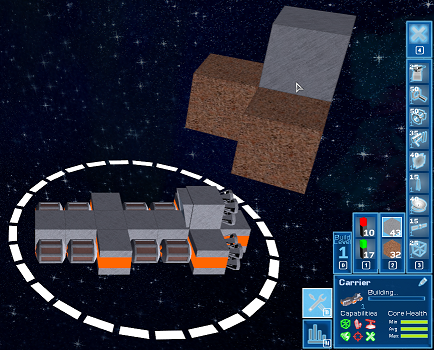 Select a block material, then click on a building icon (or use Hotkey 3) and move the mouse into the sandbox world. You can then place the building the same way you place items. Don't forget about the R key to rotate the blueprint. With the button over the building list (or Hotkey 4) you can switch to Erase Mode. That way you can use left-click to erase blocks, buildings, or items. Erasing also works in Block Mode (Hotkey 1). 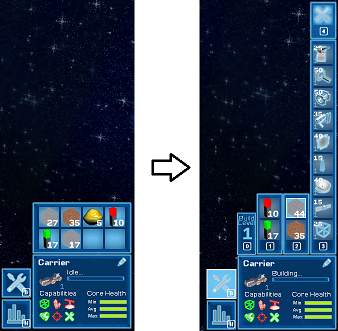 You can use Erase Mode explicitly, when there are no more blocks on your ship to select. With the button left from the item column (or Hotkey 0) you can cycle through the available build levels. If the World Level is 3 for example, you can create buildings of level 1, 2, or 3. On different levels, there are differnt types of buildings or improved buildings available to create. This page was last modified on 19 March 2016, at 13:01.